Deep Water Shoals Lighthouse was built in 1855 on the James River northeast of Fort Eustis on the shoal on the right side of the channel, above Mulberry Island Point and below Lyon’s Creek. It was a small screwpile lighthouse that was white with a red roof and had a masthead lens. The light suffered severe damage by ice and violent storms during its first year of operations. Confederates attacked the lighthouse during the Civil War. During the winter of 1867 the lighthouse was completely destroyed by ice flows. In 1868 a new lighthouse was built on wooden pilings with a sixth order Fresnel lens. 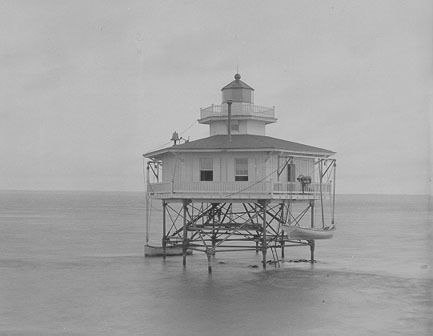 The lighthouse was deactivated in 1936 and torn down in 1966. A steel skeletal tower on the original foundation replaced the lighthouse. Photo courtesy U.S. Coast Guard (1868 lighthouse).